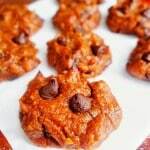 These cookies are flour-less, oil-free and naturally sweetened! It’s also filled with antioxidants, which protect your cells, and they’re a good source of plant protein. 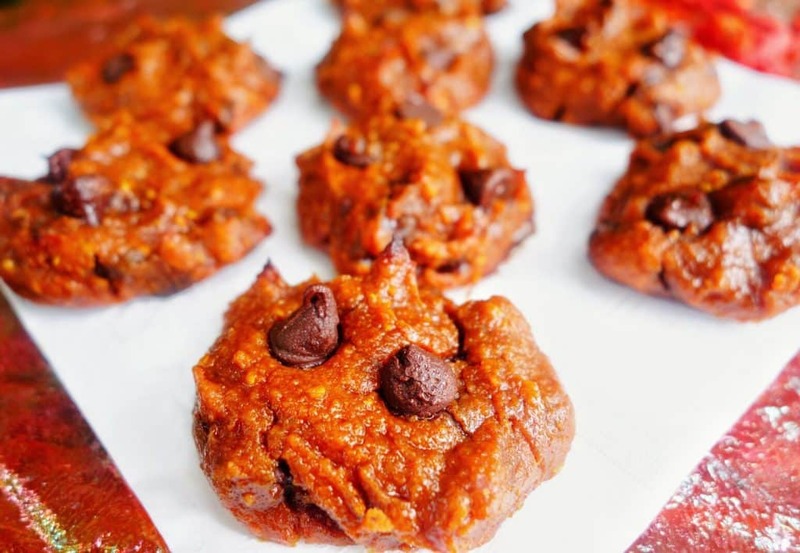 It’s one of the healthiest cookies out there, and it won’t let your sweet tooth down! I told you about the dough I made that I call GG Dessert Dip (basically like eating cookie dough without dairy or added sugar). Well, I just turned that into cookies and they’re so good you won’t believe their actually healthy! These are perfect for the sweet lover or healthier eater. 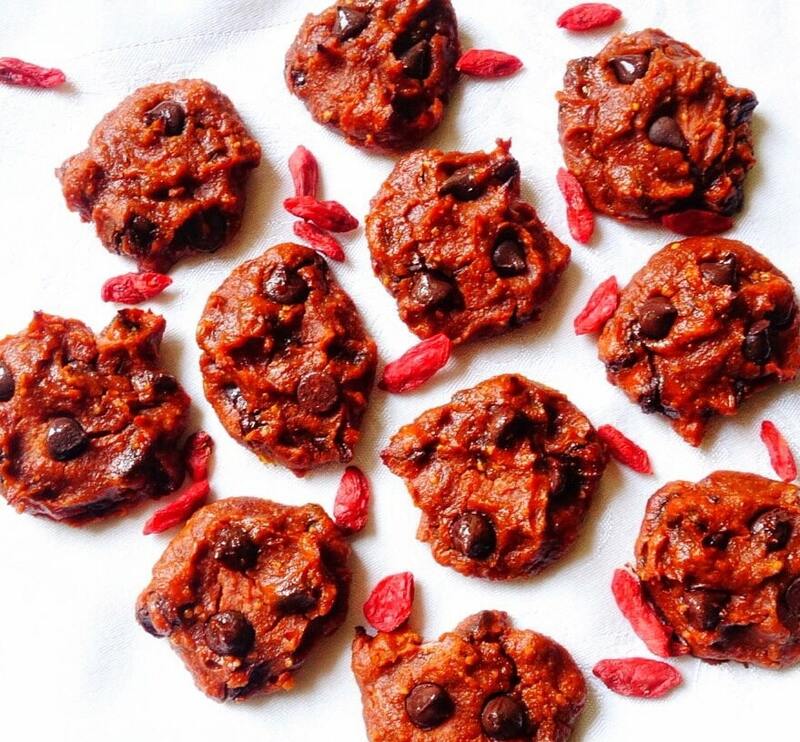 They are only sweetened from the goji berries and dates, which makes them sweet and packs them with nutritional benefit. Plus you can make them with three different toppings to suit anybody’s desire. Personally, I like using chocolate chips best. Garbanzo Beans are the base, but don’t worry NO ONE will be able to taste beans! People are shocked when I tell them they’re in it, which makes these great for kids or adults who don’t like to eat beans. Honestly, we could all use more beans in our diet because studies suggest it increases our lifespan and what better way to do it than with a cookie. Tip: I like to store mine in the freezer after cool down which enriches their flavor. I suggest storing them in the freezer or fridge once they’ve cooled enough to transfer then eat after they’ve been chilled. I love eating them with cup of tea in the evening, but it’s a perfect snack for any time of the day. 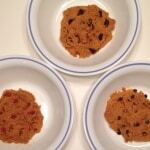 GG Cookies - 3 DIFFERENT WAYS! 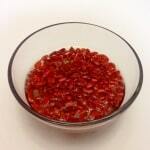 First put goji berries in a bowl of warm water to soak while you get everything else ready. Add garbanzo beans in food processor and blend. Then add the rest of the ingredients (except toppings) and the goji berries in the water, but NOT the water. Set the water aside for later. Blend it all together. 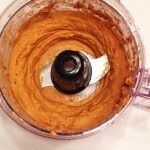 If it's not creamy enough add a few tablespoon of the water that the goji berries were soaking in and blend again. (I had to add in a couple of tablespoons.) It should be blending smooth and creamy. It may take a few minutes. Place batter in a bowl and mix in whatever toppings you prefer. I usually do the chocolate chips or cacao nibs. 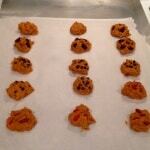 Scoop out small spoonfuls and place on baking sheet lined with parchment paper. They will not expand so you do not have to worry about them touching after baking. I flatten them out with the bottom of the spoon so they aren't too thick. Bake for about 20-23 minutes. Let them cool before serving. I prefer mine after cooling in the freezer for at least 30 minutes as it seems to enhance the flavor. I store them in the freezer as well, but you can also keep them in the fridge up to a week. They will last longer in the freezer. Great for improving and maintaining good bone health and eye health. Low Glycemic – It won’t spike your blood sugar! Very important for good health. Money Saving Tip: You can buy Goji Berries in the bulk section at Whole Foods, which will save you a little. You might be able to find them for less at local Asian Stores. Such a great recipe! Yum!